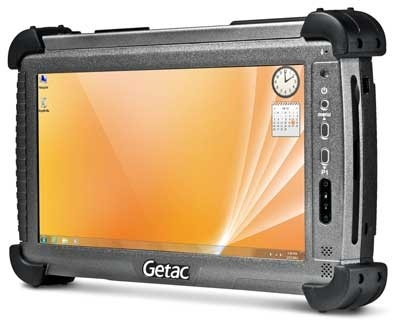 The tablet PC E110 from the rugged manufacturer Getac takes whatever you throw at it and remains reliably and mobilely operational. Thanks to its robust construction it is ideal for usage in warehouses, logistics or production. Protection class ratings IP65 and MIL-STD810G safeguard against vibration, sand, dust and water, plus it remains operable in extreme temperatures between -20C to 60C. For the necessary performance and speed it comes equipped with the Intel Cedar Trail N2800 processor with 1.86 GHz, as well as 4 GB DDR3 RAM standard. Enjoy the more than four centimeters larger multi-touch display of the E110 tablet PC, compared with its predecessor, the E100. In order to achieve this increase to 25.7 cm 10.1 Getac kept the basic outer measurements the same, however, they reduced the number of keys. Now you will only find the power switch, menu shortcuts and one programmable key for quick access on the surface. Access all additional functions via software from the touch display. Thanks to its HD resolution of 1366 x 768 pixels, a brightness of 750 nits and an anti-glare surface it always provides excellent readability - even outdoors in direct sunlight. Its light sensor automatically regulates the brightness for you. With the help of the rear-side camera 3 megapixels you can document delivery slips, damaged goods and packages, etc. on-site and send the information for processing via 802.11 a/b/g/n Wi-Fi or Bluetooth 4.0 in real time. It weighs less than 1,600 grams, making it comfortable to carry around for extended periods of time. The integrated battery operates for up to 5 hours and ensures for longer complete mobile usage. A GPS module is optionally available, as is the communications standard WWAN Gobi 3000, as well as contactless and contact-based card readers. You will find two USB ports, one serial and a RJ45 port standard, plus a 5-year warranty, to protect your investment for the future.